It is obvious that the audience are in for a real treat from the moment that musical legend Sting walks onto the Riverstage. After all, last night was the final of the Australian leg of his Symphonicity tour, and Sting clearly wants to leave our shores with a bang. 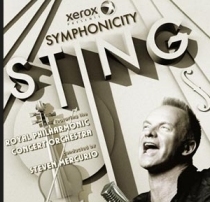 Backed by the Sydney Symphony Orchestra, Sting sifts through his lustrous catalogue of music and gives more than two dozen songs a makeover with a classical style. Hit songs such as 'Roxanne', 'Russians' and personal highlight 'I Hung My Head' are given such an incredible injection of life that at times people in the audience are left with their mouths open in awe. There are two reasons that the music is so emotionally evoking. The first is Sting's ability to bring a sense of intimacy to such a large outdoor venue as the Riverstage. At times it feels as if he is performing for us in a small jazz lounge. The second is the orchestra's masterful control of the musical texture. It is like a rollercoaster ride at times: soft hushes give way to thunderous crescendos as Sting and the orchestra's own energetic conductor confidently lead the way. Neither element outweighs the other; each compliments its counterpart perfectly. While the first half of Sting's performance contains more of his well-known songs, it is the closing section that seals the deal. It is here when he is at his most revealing. And besides, hearing somebody sing about transsexual prostitutes, vampires and foxes in love in swift succession isn't something that you can forget very quickly, especially when performed as well as this. Above all else, what is most special about tonight is that Sting takes us on a very personal journey, full of cinematic twists and luscious turns. For two and a half hours we are encapsulated in the ride, so much so that by the time we reach our final destination - and sit through three rousing encores - we are wishing for it to continue just a little while longer.